The story of the YWCA in San Pedro begins in November 1917 with six women coming together to form the San Pedro War Work Council. The Councils were part of a program sponsored by the National YWCA to address unique needs of women during World War I. Issues of concern included access to housing and recreation in urban areas with the influx of war work; meeting places around training camps where women could visit friends and relatives in the service; and concern for social morality issues, especially around military bases. In 1917, the San Pedro War Work Council commissioned a detailed report outlining the social conditions in San Pedro. Although War Work Councils were erecting mostly temporary facilities specifically for wartime use, the report strongly advised that permanent facilities were needed in San Pedro, since Fort MacArthur was located in the area and would continue to be active after the war. Built in 1918, the Julia Morgan-designed YWCA of the Harbor Area and South Bay is a clubhouse in the residential neighborhood near the harbor in San Pedro. The unassuming board-and-batten structure differs dramatically from Morgan’s most iconic commission, Hearst Castle. These two projects demonstrate Morgan’s chameleon-like ability to suit the style of her buildings to the needs and budgets of each individual client. Julia Morgan had already designed several YWCA-related projects when she was brought in to design the San Pedro facility. At a meeting in January 1918, she received the recommendations from the report that called for “a club and recreation center to compete successfully with public dances, motion pictures shows, and streets filled with men in uniform; housing with facilities for laundry and cooking breakfast; and rooms for 20 girls [to] provide for the acute emergency.” A swimming pool was a key part of the recommendations, as it offered young women a recreational outlet not available elsewhere in San Pedro. A budget of $5,000 for land, $12,000 for the building, and $2,500 for furnishings was established at the meeting. The YWCA of the Harbor Area and South Bay, despite many modifications over the years, retains the comfort and charm of Julia Morgan’s original design. After more than one hundred years of continuous use by the YWCA, the building still provides services to women and children in the community as originally intended. 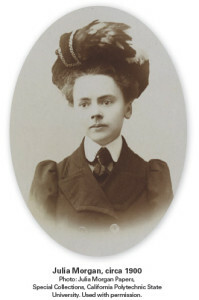 Julia Morgan (1872–1957), was one of California’s most influential architects. Remarkable not only as an independent woman working in what was traditionally a man’s field, she was also a meticulous engineer and a talented designer.